This Place of Worship was founded after 1888, and we understand it is still open. We understand this building was formerly a Mission Church of St Paul, in Stroud Road. An application was made for a grant from the Incorporated Church Building Society (ICBS) towards its construction in 1888, for which see their Archive of Church Plans Online. However a Mission Hall is shown at this location on Old Maps prior to that, for example OS 1884 1:2,250. It is not known when the premises were adopted by the New Apostolic Church. More information on the Church in the UK, Isle of Man and Ireland may be found on the website of the New Apostolic Church UKIE (nacukie.org), and a (lengthy) article about the New Apostolic Church on Wikipedia may also be of interest. Now or formerly New Apostolic Church. New Apostolic Church (formerly Mission Church of St Paul), Gloucester shown on a Google Map. Information last updated on 21 Nov 2018 at 15:31. 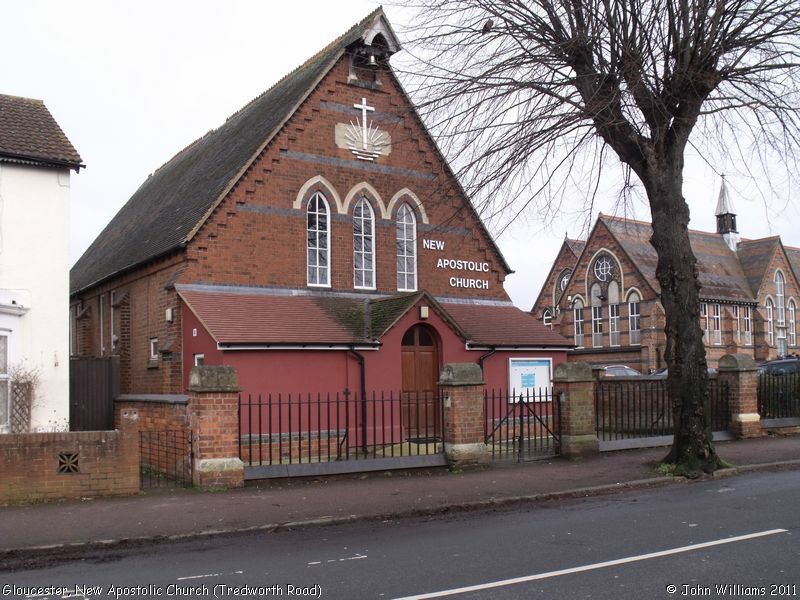 Please also remember that whilst the above account may suggest that New Apostolic Church (formerly Mission Church of St Paul) remains open and accessible, this may not remain so. This Report was created 31 Mar 2019 - 14:57:28 BST from information held in the Gloucestershire section of the Places of Worship Database. This was last updated on 7 Feb 2019 at 07:45.